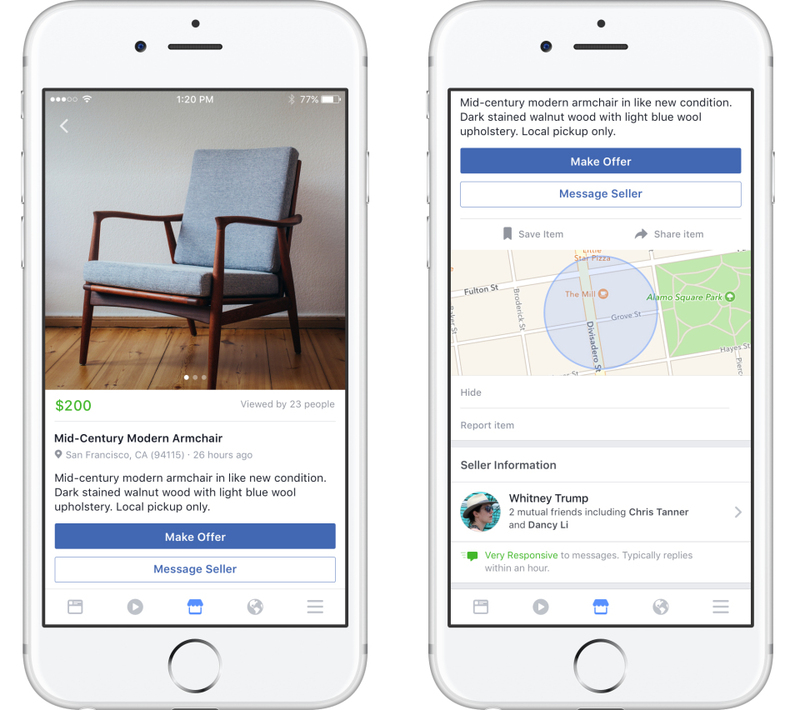 Today, Facebook introduced us to Facebook Marketplace, a new Craigslist-style forum where users can buy and sell items with their personal profiles accompanying every transaction. Facebook aficionados will recall that the company tried to introduce Marketplace 9 years ago. It ultimately fizzled out, but that was before smartphones, and in the years that followed the grassroots community of groups that were buying and selling continued to grow. More than 450 million people use Facebook for commerce, with or without a / the / its marketplace, and that number will surely grow now that they’ve slapped a dedicated UX on it. The new Facebook Marketplace has a few features that are unique among online “classifieds” services—for lack of a better term. Since it’s embedded in the mobile app, with the icon appearing along the bottom navigation band, Marketplace users can quickly find items they want based on what’s actually nearest to them. On Craigslist, it can be a challenge to narrow down searches to your county, much less your neighborhood; Marketplace allows for precise location searching. You can of course also search based on category, price or precise search terms. The app actually opens up to a feed of items being offered from within your own network, so if trust is your primary concern, this is a nice touch. Once you’ve found what you’re looking for, you just initiate a chat with the seller and make an offer—the conversation is contained within a separate Marketplace messaging thread, not lumped in with your personal Messenger chats. If you aren’t ready to commit, you can actually save the product for later. All of your correspondences and previous “transactions” (more on that later) are saved for reference. For some buyers, that may strike them as handy, for others, perhaps a little troubling. With this market being integrated with Facebook, you are putting your real profile—with whatever security settings for non-friends you may have, or lack thereof—on the radar of a potentially annoying stranger (think covert sales person or persistent creep). It’s just a little bit more personal than a random user account on eBay, or a fake name and obfuscated email address on Craigslist. On the other hand, the Facebook connection should make it much easier, as a buyer, to spot a suspicious seller before ever engaging—somewhat in the spirit of mutual friends on Tinder. From the seller’s side, it’s extremely easy and quick to post new items, so perhaps the ease of use itself will deter pesky behavior towards former buyers. It all happens from right inside the app; all you have to do is take a picture of the item, fill out a title and description, and then click a button to fire it out to your community and the extended world. Hand-raising concerns aside, Facebook Marketplace ultimately benefits from the transparency and linked-to-real-life factor. You’re staring at another person’s profile picture while you’re chatting with them—not to mention the people they know, and the people you may know in common. In today’s world, that can be enough to deter some detestable behavior (at least in theory). I wouldn’t want to do business with my YouTube subscribers. The one major drawback with Marketplace is that they don’t facilitate the complete transaction. Even though Facebook allows users to send and receive money through their messenger app, that function hasn’t been integrated into Facebook Marketplace yet. Services like eBay and Alibaba still have the leg up here with one-click buying. Marketplace is currently beta testing in 4 countries: The US, UK, Australia, and New Zealand. No one has commented on the name choice yet, even though it’s the equivalent of Snapchat opening a video store called Store. But Facebook is already a leader in the space of online transactions without even really trying, so I suppose they earned that. Given how many people use Facebook, how often they use it, and how integrated this experience is to not only their day-to-day, but to their sense of social connection, this could very quickly be the Marketplace to beat. It’s already more attractive than Craigslist. Devin Greene is a silly man from LA who's addicted to information. Bonafide, black-tar-heroin-in-a-dumpster addicted. SnapMunk is the enabler in the relationship, allowing him to research and write weird, funny stories about technology and human potential every week. Check out his YouTube channel (teamfriendshipcomedy) if you prefer sounds and faces to letters and shapes. Even though it might seem better than Craigslist, do we know the numbers that are seeing the ads on the Facebook Marketplace? It would be neat to see a comparison. Finding this post is perfect timing on my part. I just read another article that stated you can pay through Paypal now on the Messenger. I think you can reach more people via the Facebook Marketplace, wouldn’t you agree? I posted an item for sale near home.Entered correc zip code here..foto..description..price and DONE..it posts in cajeme Mexico..70 miles from my location..I’ve done this 4 times..every time..posts everywhere but where I WANT it..can anybody help?? Can you pay through the messenger for something from the marketplace just yet? That would be ideal. I think you can. I just got a notification from Facebook Messenger about sending a friend $50 because we were taking about the cost of something. The feature seems to be good to go. I really like how the facebook marketplace works and I think that its a great competitor to Craigslist. NOW that you can finally send money through the messenger, I think it will change things for the better. Love it but I not sure I feel good about the creeper out there, but once you get over that hump, the marketplace could be very useful! I thought the same thing. However, when I sold an item on the Facebook Marketplace, I just had them meet me in a public place to do the exchange. Things went perfectly! You like to play games on Facebook? If you do, take a look at how the game that you are playing is using the Newsfeed to gain more followers. That will be some good insight. Ah yes, thank you for pointing that out. I was unable to find it on my phone either. thanks! Facebook needs this, but do you think it will kill all of the “buy/sell groups” out there? 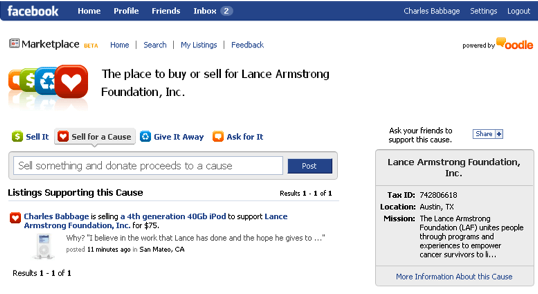 Facebook is going to do it better than Craigslist, that is for sure. For those that do not agree, just remember that EVERYONE is checking Facebook once per day and if that marketplace is attached to it, there is one less place to go online each day. More convenient, minus the lack of payment part. You have the right on the head. Facebook has the resources to make it a better marketplace, but lets just see how well they do with that project. In the past, the company has failed when trying to copy others. Love it. Not sure I feel good about the creeper out there, but once you get over that hump, the marketplace could be very useful! Well, there is nothing that is going to change that anytime you are logged into the internet, that is for sure! Game changer for the Facebook users out there. If the company could finish things up and allow for the transfer of money through the Facebook Marketplace, there are many companies that would be beat. I agree. Easier to use and search and leaving the personal profile attached is a great thing.